Small volumes of IL-12/70 elisa kit vial(s) may occasionally become entrapped in the seal of the product vial during shipment and storage. If necessary, briefly centrifuge the vial on a tabletop centrifuge to dislodge any liquid in the container`s cap. Certain products may require to ship with dry ice and additional dry ice fee may apply. MBS700437 is a ready-to-use microwell, strip plate ELISA (enzyme-linked immunosorbent assay) Kit for analyzing the presence of the Interleukin 12, IL-12/70, ELISA Kit target analytes in biological samples. The concentration gradients of the kit standards or positive controls render a theoretical kit detection range in biological research samples containing IL-12/70. The ELISA analytical biochemical technique of the MBS700437 kit is based on IL-12/70 antibody-IL-12/70 antigen interactions (immunosorbency) and an HRP colorimetric detection system to detect IL-12/70 antigen targets in samples. The ELISA Kit is designed to detect native, not recombinant, IL-12/70. Appropriate sample types may include undiluted body fluids and/or tissue homogenates, secretions. Quality control assays assessing reproducibility identified the intra-assay CV (%) and inter-assay CV(%). Principle of the Assay: The microtiter plate provided in this kit has been pre-coated with an antibody specific to IL-12/70. Standards or samples are then added to the appropriate microtiter plate wells with a biotin-conjugated antibody preparation specific for IL-12/70 and Avidin conjugated to Horseradish Peroxidase (HRP) is added to each microplate well and incubated. Then a TMB (3,3',5,5' tetramethyl-benzidine) substrate solution is added to each well. Only those wells that contain IL-12/70, biotin-conjugated antibody and enzyme-conjugated Avidin will exhibit a change in color. The enzyme-substrate reaction is terminated by the addition of a sulphuric acid solution and the color change is measured spectrophotometrically at a wavelength of 450 nm +/- 2 nm. 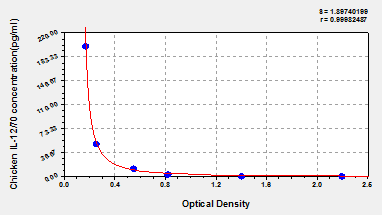 The concentration of IL-12/70 in the samples is then determined by comparing the O.D. of the samples to the standard curve. NCBI/Uniprot data below describe general gene information for IL-12/70. It may not necessarily be applicable to this product. Function: Cytokine that can act as a growth factor for activated T and NK cells, enhance the lytic activity of NK/lymphokine-activated Killer cells, and stimulate the production of IFN-gamma by resting PBMC. 1. circulating IL-35 in PDAC patients significantly increased, suggesting that regulating the expression of IL-35 may provide a new possible target for the treatment of PDAC patients, especially for the resectable ones.